1. Flake the salmon into bite-sized chunks. 2. Simply toss together the ingredients together to make the salad. 3. For the dressing, mix together the yoghurt and wasabi paste and add a little water to thin to your desired consistency. If serving straight away, drizzle the salad with the dressing and finish with chopped chives or dill, or some poppy seeds. 4. Alternatively, pack the salad and dressing separately and store in the fridge until ready to use or transport. Salmon is an excellent source of protein, as well as Omega 3 and 6 fatty acids. This salad is really simple to put together and will keep well in the fridge for a day or so. Save time by buying ready-cooked salmon, but check for salt and other additives. Please note that it may take few minutes longer if you need to cook the salmon, although this doesn’t take very long. Salmon is a great source of protein, and our featured ingredient – edamame, or soya beans, are wonderful for your pre or post workout recovery. Ignore the false rumours that these magical beans lower your testosterone! They do contain phyto-estrogens but upon entering the male body, these don’t act like estrogen. So soya beans don’t lower your testosterone or harm muscle mass. Both pre and post workout – soya beans, or soya protein powder can help your recovery. 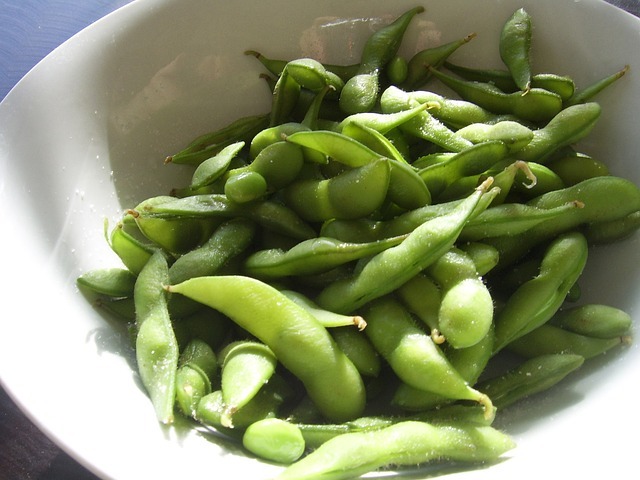 They are also jam-packed with macro-nutrients.Soya beans are equivalent to an animal food (meat) in terms of protein.